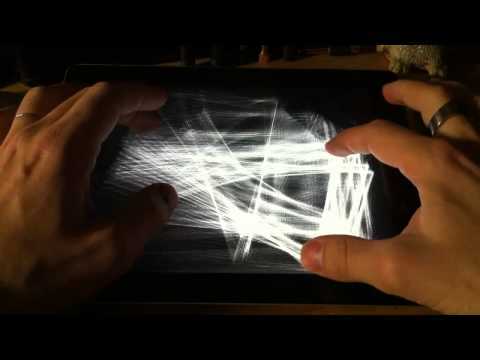 The videos below do a better job of depicting Thicket, but here's a screenshot. 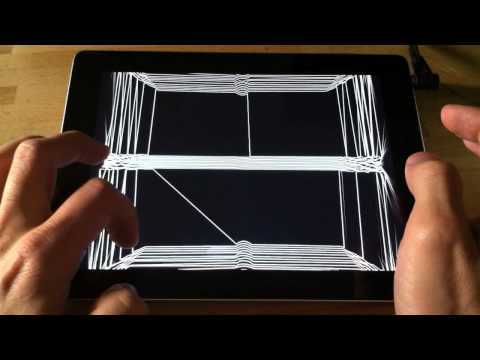 We’ve already tortured our favorite metaphor for apps like this — “fingerpainting with sound” — enough, but it’s still the best way to describe apps like Interval Studio’s Thicket, which take advantage of the iPad’s and iPhone’s touchable screens to let you draw music in real time with your fingertips. We tested the new Thicket (also called “Thicket Reboot”) on an iPad, which is the only device that can run it at this point. The earlier iterations, Thicket:Classic and Thicket:Sonic, also work on iPhone and iPod Touch, though their small screens limit how much fun you can have. 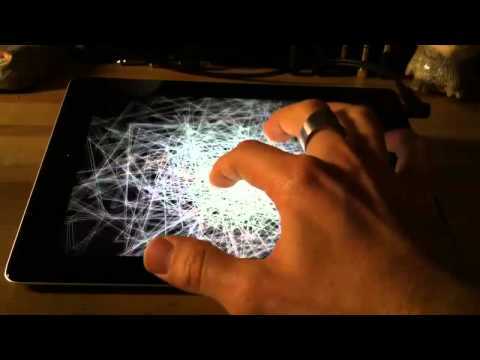 Thicket for iPad is free, but it comes with just one “mode” — Interval Studio’s word for an interactive song.The included “Sine Morph” mode is a chill-house groove with a simple beat and theremin-style sounds (thus “sine”). Holding the screen in multiple points tweaks filter sweeps and other parameters, letting you affect how the mode sounds in real-time. Nifty line visualizations follow your fingers and float around the screen on their own to reflect what you hear, and you can tap spots to create new beats that repeat on their own (this mode is always creating loops). Playing with the included “Sine Morph,” we felt it had a nice combination of versatility and control that would allow a club or party organizer to let random people mess with the app without rendering the results unlistenable or even undanceable, while still clearly allowing users to control the sound. It’s a tricky balancing act that Interval Studios pulls off with aplomb, but it’s a bit limiting. Musically, we could imagine hearing it in a downtempo chillout room in Amsterdam, and it’s nice, but it’s all you get unless you buy more modes. All-in-all, this reboot of the popular Thicket series is a nice, new way to make nice or weird music on your iPad, even with zero musical training. It could stand to have modes included as well as more available for purchase, as well as a “record, upload and share” option, but these are early days for the new Thicket, released this on Wednesday. As things stand now, Thicket is suitable for public performance, and also works if you just want to sit there by yourself, listening on headphones or with the iPad connected to speakers using a wire or AirPlay. Another option: you can give it to a kid, thanks to a child lock setting that keeps the fun going without letting them sign out of the app. Recommended. 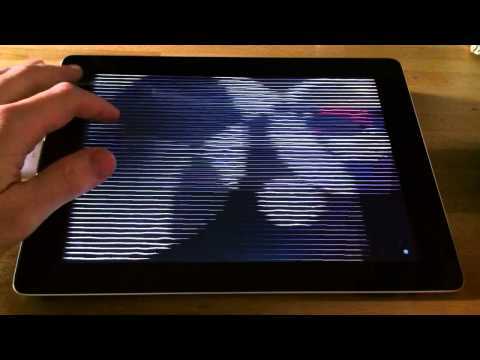 This is one of the first apps I’ve seen that’s truly made me wish I had an iPad. Good job.